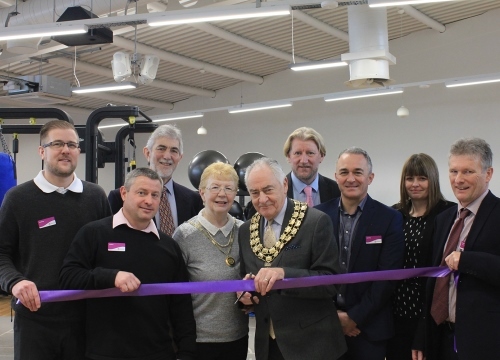 Cllr Bob Awty, Chairman of Lichfield District Council, along with Cllr Wilcox and Cllr Leytham, joined our directors to formally cut the ribbon to the newly refurbished leisure centre today. After committing to improvements at the centre upon taking over operations in February 2018, we are pleased to finally unveil the new facilities after a year of work. As a not-for-profit leisure trust we invested £1.6 million in partnership with LDC to modernise the building making it more energy efficient and lessening its environmental impact, in a bid to reduce C02 by 392 tonnes a year, while also greatly improving the facilities on offer. Highlights include a brand new 70-station gym, a brand new state-of-the-art MyRide cycling studio; offering instructor led and virtual sessions, a brand new group exercise studio, a new Freedom Café serving Costa Coffee, and in direct response to customer feedback – a new sauna and steam room, opening in a few weeks’ time. Of the newly refurbished centre, our Managing Director, Ivan Horsfall-Turner, said: “We’re delighted to unveil this extremely high-spec centre which features one of the best gyms in the area and a cycling studio to rival the top boutique studios in London! Thu 6 December New Gym and Studios Open !